This article is about the biblical person. For other uses, see Lot's wife (disambiguation). In the Bible, Lot's wife is a figure first mentioned in Genesis 19. The Book of Genesis describes how she became a pillar of salt after she looked back at Sodom. She is not named in the Bible but is called "Ado" or "Edith" in some Jewish traditions. She is also referred to in the deuterocanonical books at Wisdom 10:7 and the New Testament at Luke 17:32. Islamic accounts also talk about the wife of Prophet Lut (Lot) when mentioning 'People of Lut'. The Sodom and Gomorrah motif from the Nuremberg Chronicle by Hartmann Schedel, 1493. Note Lot's wife, already transformed into a salt pillar, in the center. The story appears to be based in part on a folk legend explaining a geographic feature. The Jewish historian Josephus claimed to have seen the pillar of salt which was Lot's wife. Its existence is also attested to by the early church fathers Clement of Rome and Irenaeus. In Judaism, one common view of Lot's wife turning to salt was as punishment for disobeying the angels' warning. By looking back at the "evil cities," she betrayed her secret longing for that way of life. She was deemed unworthy to be saved and thus was turned to a pillar of salt. In Islamic tradition, Lot (Lut, Arabic: لوط‎) lived in Ur and was a nephew of Ibrahim (Abraham). He migrated with Ibrahim to Canaan and was commissioned as a prophet to the cities of Sodom and Gomorrah. He was commanded by Allah to go to the land of Sodom and Gomorrah to preach monotheism and to stop them from their lustful and violent acts. Lut's messages were ignored by the inhabitants, prompting Sodom and Gomorrah's destruction. 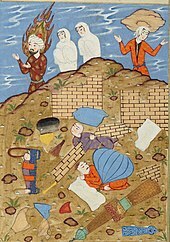 Though Lut left the city, his wife looked behind and was destroyed. "Lot's Wife" pillar, Mount Sodom, Israel. ^ a b c d e f g h Schwartz, Howard (2004). Tree of Souls: The Mythology of Judaism. ISBN 9780195358704. ^ Hamilton, Victor P. (1995). "looking (back)". The Book of Genesis: Chapters 18-50 (Google eBook) (2nd. ed.). Grand Rapids Michigan: Eerdmans. p. 49. ISBN 9780802823090. ^ Hirsch, Emil G.; Seligsohn, M.; Schechter, Solomon; Jacobs, Joseph (1906). "Lot". Jewish Encyclopedia. ^ National Library Board (2014). Wang Dayuan - Singapore History. ^ Scharfstein, Sol (2008). Torah and commentary : the five books of Moses : translation, rabbinic and contemporary commentary. Jersey City, NJ: KTAV Publishing. p. 71, #26. ISBN 9781602800205. ^ a b Hasan, Masudul (1987). History of Islam, Volume 1. Islamic Publications. p. 26. Retrieved July 9, 2012. Quote: Lut was a nephew of the Prophet Ibrahim. He migrated with Ibrahim from Iraq to Canaan in Palestine. He was commissioned as a prophet to the cities of Sodom and Gomarrah, situated to the east of the Dead Sea. The people of these cities were guilty of unspeakable crimes. They were addicted to homosexuality and highway robberies. Lut warned the people but they refused to listen to him. He prayed to Allah to punish the people. Lut left the city with his followers at night. As soon as he left, Allah raised a [shower of brim stones? ]-end quote, text garbled. ^ "Tafsir Ibn Kathir". Quran 26:170–171. qtafsir.com. ^ Carroll, John T. (2012). Luke a commentary (1st ed.). Louisville, Kentucky: Westminster John Knox Press. p. 351. ISBN 9781611642025. 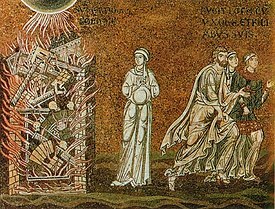 Wikimedia Commons has media related to Lot's wife made into a pillar of salt.